I'll be the first to admit that I lost track of a whole slew of my preferred bands during the MTV-infected 80s as that mind-numbing phenomenon made me gradually become disgusted and cause me to lose interest in what was going on in the world of music. 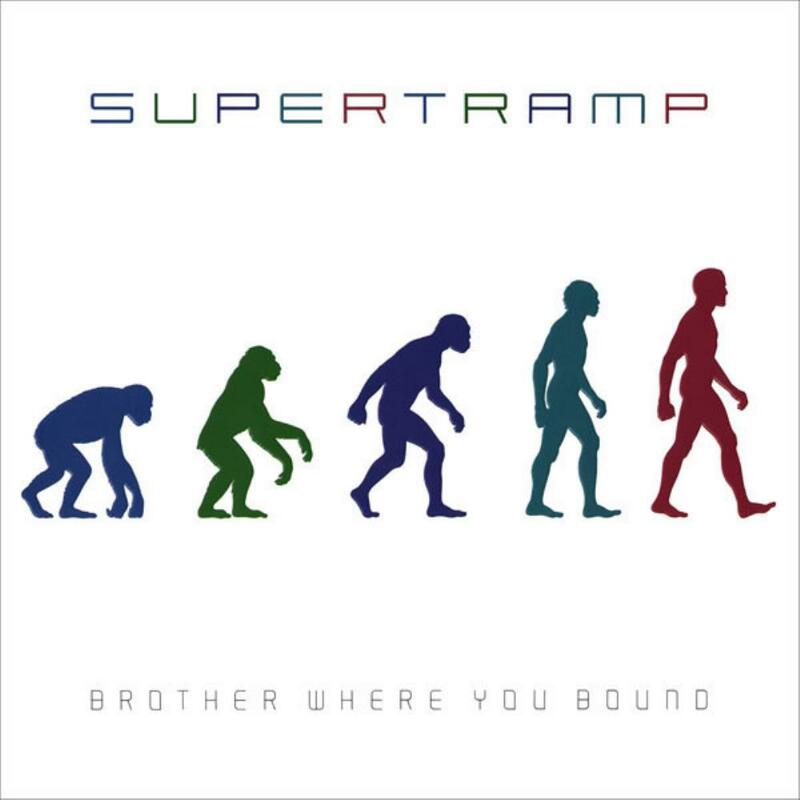 One of those groups was Supertramp so I'm methodically gathering up the albums I somehow misplaced along the way or never heard in the first place. "Brother Where You Bound" belongs in the latter category and I'm very pleased to tell you that it's surprisingly fresh and invigorating from beginning to end. The fact that it was released in 1985 (the middle of the dark ages for prog) and that it was their first outing following the departure of long-time co-writing icon Roger Hodgson makes it even more impressive. Having an infectious dance beat doesn't necessarily mean that a song shamelessly panders to the lowest common denominator and "Cannonball" is proof positive. It has a bright piano tone, several hot horn section breaks, a funky guitar roiling underneath that adds sizzle to the track and intriguing synthesizer settings that don't come off as dated in the least. It never leaves the key of G but the clever arrangement keeps it from getting stale. Plus, it's one of the best put-down tunes you'll ever find. "You can say what you want all day/but I've never been so outraged/I'm washing my hands of you/how could you be so untrue," Rick Davies snipes. Yet he croons a complete turnabout on the very next cut, "Still In Love." John Helliwell's lone saxophone wails soulfully just before the band enters with a rocking shuffle beat as Rick laments that his deceitful woman's got him "dancin' on a string/like I just don't mean a thing/'cause you know that in the end/I'll come runnin' back again." The poor sap is hopeless. Make no mistake, though, this tune is a fine showcase for John's gritty sax along with his expertly-layered horn tracks and it never droops for a moment. A moody piano and deep synthesized strings provide a stunningly dark intro for "No Inbetween." Davies provides all the lead vocals on this album and his vocal chops are particularly striking here as he describes the dichotomy of being a big deal in the music biz for a decade and a half. "The simple fact is/there really ain't no inbetween/you're either up there/or scurryin' round and lookin' lean," he relates. Once again Helliwell's searing saxophone is superb throughout and I love the way the ambiguous ending leaves me hanging. "Better Days" features a giant, proggy start (especially for the mid 80s) and colorful spaces where drummer Bob Siebenberg's fills tastefully avoid overindulgence. As I write this we citizens of the USA are about to be inundated and thoroughly beaten down with empty campaign promises from both side of the ideological fence and the sarcastic lyrics of this song are as relevant now as they were when Rick penned them. "More food, higher wages/good schools, smiling faces/make way for the new way/better days, better days" he boldly preaches to the masses with tongue planted firmly in cheek. Beefy synthesizer lines lead to some exciting Latin percussion as the group jams out over sound-bite examples of candidates spouting empty phrases ad nauseum. The album's title song answers the question of what would happen if Supertramp and Pink Floyd came together for a day. Sorta. Not only is "Brother Where You Bound" their longest track ever, it's also one of their most eclectic. It begins with a phonograph needle lowering onto a vinyl record before ominous synths approach from the horizon like looming storm clouds while undecipherable voices mumble phrases from Orwell's "1984" underneath. A rolling piano takes over for a verse, then the group comes in strong with a driving beat and unison, chanting vocals. The song is a sad commentary about world politics and the human condition. ".the message that they're giving you/is the same old alibi/if you don't quite see their point of view/then they treat you like a spy," he sings. It all leads to a half-time mid-section where guest guitarist David Gilmour steps in to alter the scenery as only he can while Davies delivers some of the most emotionally-charged vocals I've ever heard from him. After a false fadeout a somewhat psychedelic free-for-all ensues before a calm guitar riff brings things back into line. Having said that, it still doesn't take you where you expect it to as the tune's structure remains unpredictable until booming drum accents introduce a new segment with vocals mixed in with horns and they finally cut Mr. Gilmour loose to lay waste to the landscape with his piercing solo. Evidently prog had a pulse in '85 but who knew? This is great stuff. After that wild excursion they wisely end the album with one of Rick's simple but exquisite piano and vocal numbers. "Ever Open Door" is a bit melancholy yet it carries a hopeful message. "I've got a feeling inside me/I'll put the past way behind me/pick myself up from the floor/I want my sun in the morning/want my friends to come calling/I'll keep a welcome outside my door," he adds. The dense synthesizer strings add a smooth texture to the song's reassuring atmosphere. I didn't expect this to be even close to being this good but I'm glad to report that it ranks up there alongside "Even in the Quietest Moments." in my book. And, for the era it came out in, this album flew its prog banner proudly in the invisible war between the overwhelming throngs who thought Madonna, Whitney Houston and Michael Jackson hung the moon and those of us who longed for a return to the days when musicians weren't afraid to take risks and push the envelope. 4.2 stars.